The lawn at the Gerald R. Ford Amphitheater is a popular place on Wednesday night as violinist Pinchas Zukerman and the Dallas Symphony Orchestra kicked off the 28th season of Bravo! Vail. VAIL — Four years ago, the Dallas Symphony Orchestra opened the Bravo! Vail music festival with Beethoven’s Seventh Symphony and the skies opened. So, under dry skies, Pinchas Zukerman and the Dallas Symphony Orchestra, led by Jaap van Zweden, opened the 28th season of the Bravo! 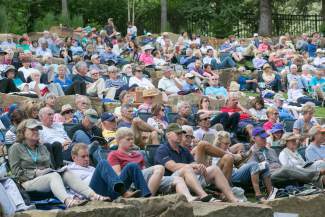 Vail festival with an all-Beethoven program of his Violin Concerto and Seventh in front of a near-capacity crowd at the Gerald R. Ford Amphitheater on Wednesday evening. Had it rained again during the Seventh, one could have forgiven the DSO for taking the weather personally. Yet locals and visitors from the Metroplex alike applauded the evening. Walt and Kelly Dill, from Arlington, Texas, said they’ve been coming to Vail for 40 years and having the Dallas Symphony Orchestra in town simply adds to the occasion. “I enjoy every shiver up here,” Kelly joked about the weather. For the record, it was 93 degrees on Wednesday back in Dallas. John and Patti Bartholomew, of Eagle, have attended Bravo! Vail for years, but they finally broke down and bought lawn passes for this season. As most do on the lawn, they came in style with soft chairs and a serious picnic menu — shrimp, fruit as well as cheese and crackers. And then there was the main attraction, Zukerman performing. After the orchestra performed the national anthem, which was joined in good voice by the audience, Zukerman took to the stage, clad in all black summer casual with an open-collar shirt. Zukerman had the audience rapt with a poignant rendition of the Beethoven Violin Concerto. Inopportune applause after the first movement did not deter Zukerman from an expansive interpretation of the work. The audience gave Zukerman a rousing standing ovation and two curtain calls, during which the violinist and van Sweden playfully jousted for the honor of taking the front and center bow. After the intermission, van Zweden and the Dallas Symphony Orchestra took a spirited approach to the Seventh, which concluded with a collective appreciative gasp from the audience. Wednesday was the first of three traditional concerts for the Dallas Symphony Orchestra at the amphitheater. Friday’s concert is all-Mozart with his 25th Symphony and the Requiem. The Colorado Symphony Chorus will be the choir for the latter. On Monday, Alessio Bax and festival artistic director Anne-Marie McDermott join the Dallas Symphony Orchestra for Poulenc’s Concerto for Two Pianos, followed by Berlioz’s Symphonie Fantastique. Staff writer Chris Freud can be reached at 970-748-2934, cfreud@vaildaily.com and @cfreud.